Low-cost automation for your system strapping demands, this side seal strapping equipment can widely increase your productivity, and makes your strapping job easier with extraordinary competitive advantages. Accommodating to wide range of product sizes, effectively making the strapping securing process maximizes your production speed. Used for polypropylene straps in broad range of straps width, the automatic strapping can be applied for general industry usage with its side side advantage, which can be integrated with your existed conveyor system without any difficulties. Unmanned & fully-automatic apply strapping on the product with photocells detection. 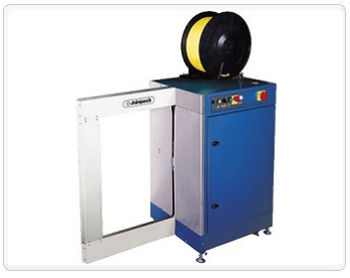 This high quality automatic strapping machine contains side heat sealed elements for maximum seal efficiency. With several valuable optional functions including auto load in feed and retracting system, loop ejector and short feeding detection device, the extra options features add up its strapping performance and its user-friendly characteristics. The top press unit extends more your strapping types to be made as request. The most reliable and robust strapping equipment and the magnificent and standout packaging machine for your daily operation.